Bruce Lee remains the single most iconic figure in the history of martial arts cinema and the subject of continued fascination for genre fans and martial artists alike. In March Kaleidoscope Home Entertainment will be releasing two documentaries about Lee on UK DVD: Bruce Lee: In Pursuit of the Dragon and Bruce Lee: A Warrior's Journey. Bruce Lee: In Pursuit of the Dragon is a fascinating documentary from award-winning Bruce Lee expert, John Little. It follows the chronology of Bruce Lee's films (The Big Boss, Fist of Fury, The Way of the Dragon and Enter the Dragon), which were filmed across Thailand, Macau, Rome and Hong Kong. Re-mastered extracts from the features are combined with state-of-the-art, high-definition videography, transporting the viewer back to the countries and locales that made martial arts movie history. In addition, this documentary features interviews with key cast that performed alongside Lee. No stone has been left unturned and no location has been ignored. In Pursuit of the Dragon also features a bonus feature – the last surviving on-camera Bruce Lee interview. 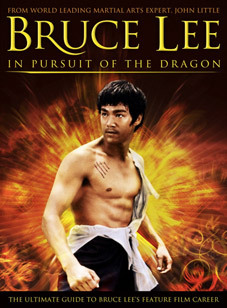 Bruce Lee: In Pursuit of the Dragon will be released on UK DVD by Kaleidoscope Home Entertainment on 12th March 2012 at the RRP of £15.99. Bruce Lee: A Warrior's Journey is a revealing documentary that uncovers the very soul of Bruce Lee for the first time; his battles against cultural and professional bigotry; how he survived his near crippling back injury; and how he developed a radically new approach to martial arts based upon his philosophy of total freedom for the individual practitioner. It is the story of how he used these experiences and ideologies to create a syle of martial arts cinema that has yet to be equalled. The documentary includes three legendary action sequences, filmed for his unfinished Game of Death, that were not originally used. They have now been found, restored and are presented here for the very first time. 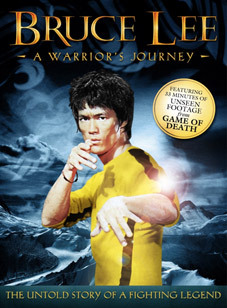 Linda Lee Cadwell, Bruce Lee's widow, said this of the film: "Finally, after all these years, Bruce has been given a stage and allowed to show his worldwide fans exactly what he had in mind for this film [Game of Death]." Bruce Lee: A Warrior's Journey will be released on UK DVD by Kaleidoscope Home Entertainment at the RRP of £15.99.